Sam Welles was born in Gloucester, Massachusetts, on November 9, 1909. His parents moved to Berkeley when he was four years old and he remained a Berkeleyan for the remainder of his life. He graduated in 1930 with a double major in history and political science. Thankfully for us, he needed a job and took a position as preparator in the Museum of Paleontology under Dr. William D. Matthew. 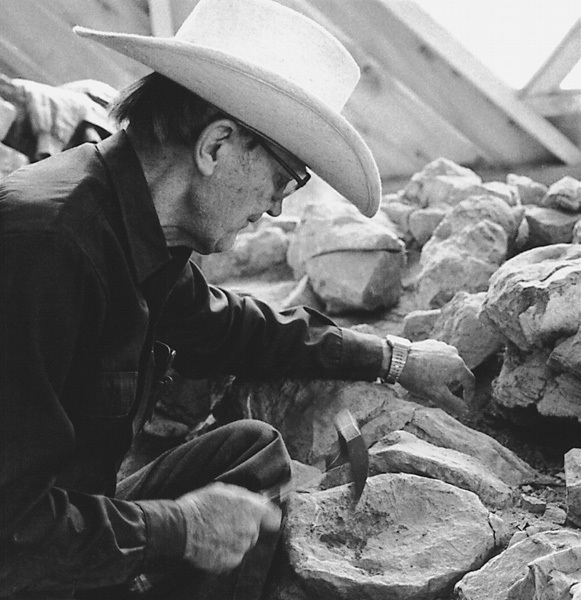 He was sent off to learn field collecting techniques at the Hagerman, Idaho horse quarry, and then worked with Ruben Stirton in the Texas Neogene, and Charles Camp in the Permian and Triassic of Arizona and New Mexico. An important early field project was collecting the long-necked plesiosaur skeleton Hydrotherosaurus alexandrae and other Cretaceous marine reptiles from the Panoche Hills in Fresno County, California. As a staff member he was permitted to enroll in one course per semester, and during the early 1930s he mastered the geology, zoology, and paleontology courses required for graduate study. 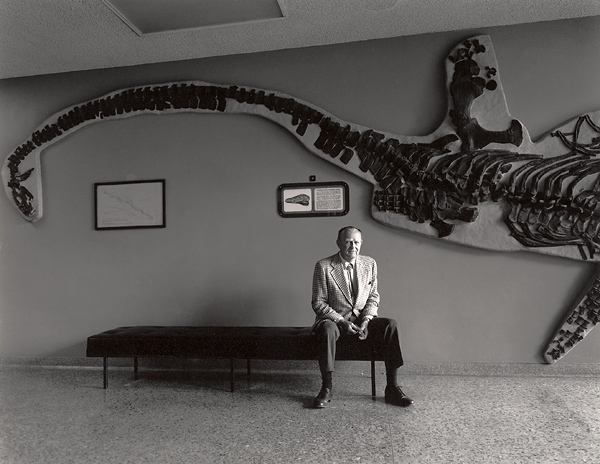 He earned his doctorate in paleontology in 1940 with a dissertation on Cretaceous plesiosaurs. In 1938 he and Dr. Camp located a rich deposit of labyrinthodont amphibians and fishes in the early Triassic Moenkopi Formation near Meteor Crater, Arizona. 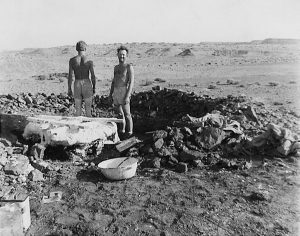 Other fossiliferous deposits in the Moenkopi were found near Holbrook and Cameron, and these faunas became the basis for several studies by Sam. In the Cameron area he also discovered the first essentially complete dinosaur skeleton (Dilophosaurus) from the early Jurassic of the southwestern United States. 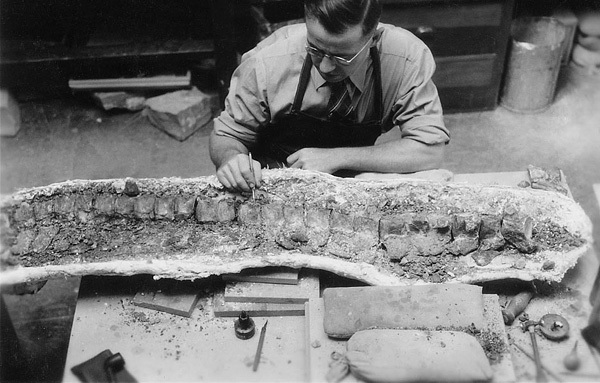 In 1940 Dr. Welles was appointed part-time Instructor in the Paleontology Department. He taught introductory vertebrate paleontology for several years while continuing his research on plesiosaurs and labyrinthodonts. He continued close collaboration with Professor Camp on studies of Triassic reptiles and amphibians. During World War II paleontological research was suspended, so Dr. Welles was placed in charge of the radio instruction program in the Engineering Sciences War Training program of the Electrical Engineering Department. In 1946 he returned to his full-time position with the Museum. 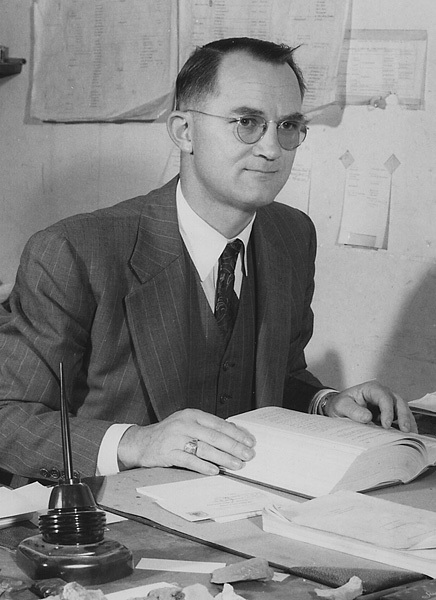 He actively collaborated with Dr. Camp in compiling the Bibliography of Fossil Vertebrates during the 40s and 50s. 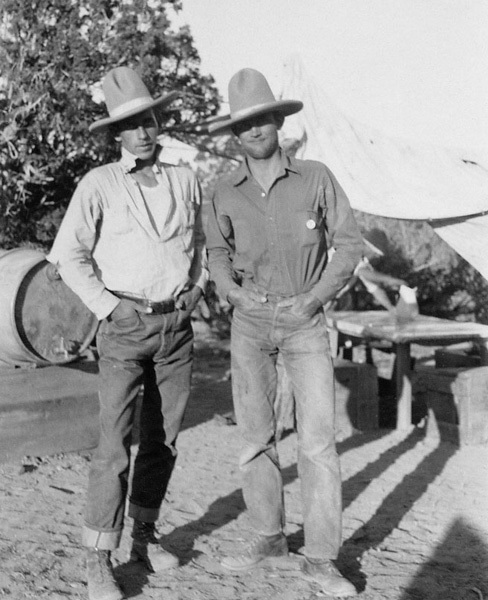 In 1947 Sam led a group of ten students to work in the Moenkopi near Cameron. The students received college credit for the work and the Museum benefitted by their collections. This preceded the University Research Expeditions Program (UREP) by several decades [Note: UREP has been discontinued since this writing]. 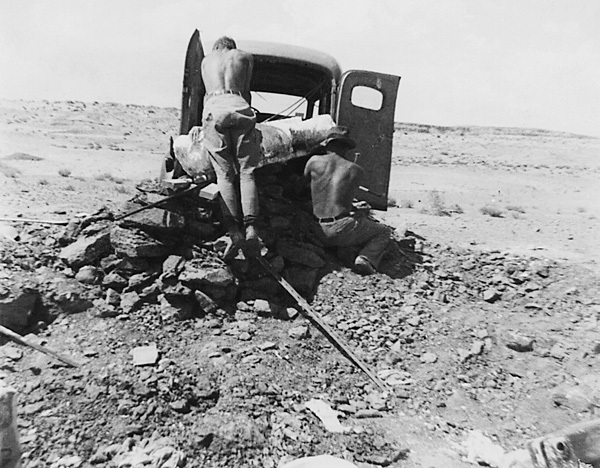 In 1947 the Society of Vertebrate Paleontology conducted a Field Conference on the Triassic of Northern Arizona. Starting from St. Johns, they visited several sites in the Chinle and Moenkopi Formations, including the Placerias Quarry, Petrified Forest National Monument, and Painted Desert. From a point southwest of Winslow, the party prepared to continue on to Meteor Crater. Dr. Welles suggested that, rather than retrace their tracks over rough roads to Winslow and follow the highway west, they should take a shortcut, heading more directly across country toward the crater, plainly visible across the flat plain. 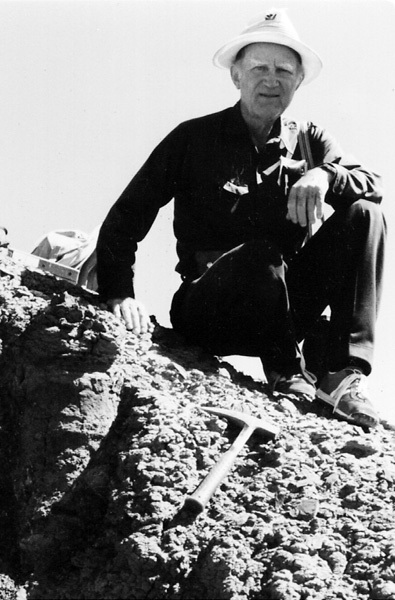 One conference participant, Bryan Patterson, reported later, “The ‘Welles Cutoff,’ between Moqui Wash and Meteor Crater, gave everyone an intimate acquaintance with the Moenkopi-Kaibab contact and with the surface relief of the Kaibab limestone itself.” After crossing three or four increasingly deep and steep-sided arroyos, the caravan paused by a water tank, and to the consternation of his companions, Dr. Welles climbed the windmill to spy out the route ahead. Fortunately for the group (and Sam) they had passed the last real obstacle. During the 1950s Sam assisted Dr. Camp excavating large Triassic ichthyosaurs near Berlin, Nevada. This site became Nevada’s Berlin-Ichthyosaur State Park in 1956. Sam studied mosasaurs from the Cretaceous of Wyoming, plesiosaurs from Colombia, and mosasaurs from the Panoche Hills; he travelled to Mexico looking for Triassic fossils, returned to Meteor Crater, collected plesiosaurs in Montana, and did further work in the Moenkopi. 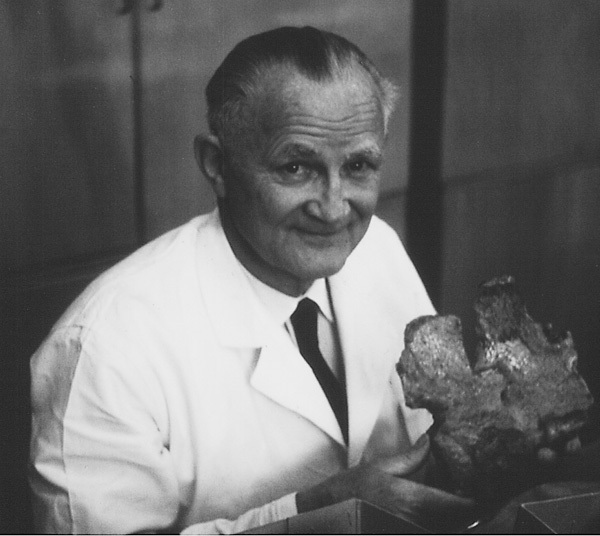 Dr. Welles served as president of the Society of Vertebrate Paleontology in 1962 and was made an Honorary Member of the Society in 1990. He spent 1969-1970 in New Zealand working on plesiosaurs and other marine reptiles. In 1977 he did a new study of Dilophosaurus which took him to England and Germany for comparisons with various European taxa. In 1982 and 1983 Sam led UREP expeditions to Berlin-Ichthyosaur State Park in Nevada to stabilize the in situ skeletons and install a map or diagram of the exposed specimens. He was honored by the State of Nevada for his efforts in developing and protecting this site. In 1986 he described a long-snouted trematosaur from the Moenkopi. He joined another UREP party to the Triassic Chinle beds in the Petrified Forest and St. Johns areas of Arizona in 1989. After the move to the Valley Life Sciences Building he worked at home, coming to the Museum frequently to examine specimens. He was an active tennis player and maintained excellent physical condition for field work. Sam Welles passed away on August 6, 1997, at the age of 89. The UCMP archives contain the papers of Samuel P. Welles which can be accessed by historians and researchers. In 1964 I took up the position of Curator of Geology at the Canterbury Museum (Christchurch, New Zealand) and soon became aware of the fossil marine reptiles in the collections, if only by the bulk of the specimens. Along with the University of Canterbury, the Museum made an application for a Fulbright Fellow to carry out the research on these fossils. In the meantime in 1967, I spent three months visiting museums in the U.S., including UCMP, and met Sam Welles for the first time. Having accepted the Fulbright scholarship, Sam arrived in Christchurch on September 4, 1969 and was based in the Department of Geology of the University of Canterbury. He rented a pleasant house in the northern suburbs of Christchurch in preparation for the arrival of his wife. When she was not able to come, Sam chose to live more modestly and shifted to a room south of the railway line, in one of the then less affluent suburbs. I remember him calling the police when one of his fellow tenants parked a car in the driveway that prevented Sam removing his borrowed Morris Minor. Sam intended to stay in New Zealand for about six months and it soon became clear that he was not going to be able to complete the project in that time. At his request, I took a more active role in assisting him and was released from most of my other duties at the museum. I had not done any serious paleontology before and under Sam’s guidance I rapidly absorbed some reptilian osteology. The bones were extracted from the calcareous matrix in tanks of acetic acid and the department soon smelled like a pickle factory. Sam worked on drawing the bones; I helped with the preparation of the specimens, with the assistance of two volunteers. Sam was a hard worker and expected others to match his efforts. Sam left New Zealand in April 1970 and I was left holding a draft and somewhat confused manuscript. We continued to cooperate (how I wish we had had faxes or e-mail) and the paper was completed and published in 1971. I enjoyed working with Sam although I soon learned to avoid any discussion of politics. Sam made a great contribution to the vertebrate paleontology of New Zealand, as is evidenced by the following two publications resulting from his brief period there. Fleming, C.A., D.R. Gregg, and S.P. Welles. 1971. New Zealand ichthyosaurs — a summary, including new records from the Cretaceous. New Zealand Journal of Geology and Geophysics 14(4):734-741. Welles, S.P., and D.R. Gregg. 1971. Late Cretaceous marine reptiles of New Zealand. Records of the Canterbury Museum 9(1):1-111. Please convey my sympathy to all at Berkeley and to Sam’s family. I have known him for a long time as did all temnospondyl paleontologists. He was always hospitable when I visited Berkeley, offering accomodation in his home or, if not that, at least an excellent lunch. He stayed with me in Sydney when I was a poor post-doctoral student. I remember taking him to a rooftop party overlooking fireworks on Sydney Harbour — maybe it was New Year’s Eve. He was the life of the party, most attendees being 40 years younger than he, and we were among the last to leave. Sam was a great favorite on our UREP field trips. He would amuse people endlessly with his stories about the old days, and our volunteers delighted in watching his tricks for even basic tasks like cutting up burlap sacks and mixing plaster. He had a panache and knew how to be showman when the occasion demanded. And he also had a fiercely independent turn of mind. Sam never liked to carry water, especially in the mornings, even in the hottest weather. He didn’t believe in drinking much in the field — said it made you thirsty all day. In Arizona the temperature was over 90, and Sam was well over 70. When the crew disembarked from the vehicles to begin prospecting, he would head out at an oblique angle from the rest of the people, which made it difficult to keep track of him. We finally decided that we would send someone to shadow him, not so much because we feared for his stamina, but because someone else might get him to carry and extra bottle of water for them, and maybe he might take a plug at it now and then. It worked, but only because we assigned one of our young ladies to the task, and Sam could hardly refuse. Sam’s early field crews consisted of a few students or whoever had the interest and stamina to stick with it, and these were the days before all-terrain vehicles and steel-belted tires, so the going was slower. It was harder to get in and out of places, and people were used to going out in the field and staying there. Today, those distances are closer to the practicalities of civilization, but it makes you think of the dedication that brought the Museum some of its finest specimens when the human cost of getting them was much higher. Lentils were the staple of Sam’s field crews in the 1940s and 1950s, and field conditions were pretty primitive. Once a week, it was said, Sam (with his characteristic parsimony) would add a can of Spam to the pot. There were, of course, legends about the time that his crew came upon a rotting carcass of a horse which, however, had enough passable meat left to furnish the party … but that is a story perhaps better left undetailed …. Sam was always generous with his time, whether for students, colleagues, or members of the public. He was patient in explaining his work, the details of his dinosaurs and amphibians, and even the intricacies of braincase morphology to anyone who would listen. But he explained the details so well that they couldn’t fail to be interesting. His generosity extended to the small thoughtful things too. One time he knocked on my door with a copy of Huene’s Palaeontologie und Phylogenie der Niederen Tetrapoden, a German textbook on tetrapods long out of print but invaluable for the continental perspective of mid-1950s paleontology. He just figured I could use it in my classes, and he was right. A good many graduate students cut their teeth on the German language through that book. From UCMP News, December 1997, with minor modifications by Dave Smith, 2008.